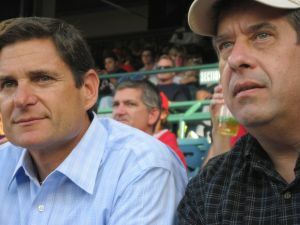 Former Angels’ case Judge Peter Polos and columnist Frank Mickadeit at the Angels-Brewers on Thursday. So you really haven’t been back?” Peter Polos asked as we went through the turnstiles at Angel Stadium. “Not since your decision,” I confirmed. “Not my decision – the jury’s decision,” he reminded me. Yes, I broke my five-year boycott of Arte Moreno’s Angels on Thursday. I’d sworn I wouldn’t return to the stadium until its tenants’ name went back to Anaheim Angels, but it’s time to move on. A good reason to break it was that Polos agreed to go with me. Polos, the judge who presided over City of Anaheim vs. Angels Baseball L.P.
Polos, 45, stepped down earlier this year after just eight years on the bench. He has a 9-year-old daughter with juvenile rheumatoid arthritis. He wanted to be an out-front advocate and fundraiser for the Juvenile Arthritis Foundation. The judicial conflict-of-interest rules don’t allow him to do what he wants. He was also worried about the decreasing funding for the courts and the uncertainty of the county pension-and-benefits system. He’s landed pretty well, with Panish Shea & Boyle, which claims the largest personal-injury award in U.S. history, $4.9 billion against G.M. The money he’s earned on the mediation side of his practice he has donated to charities: the J.A.F., the Grossman Burn Center and the O.C. Public Law Center. We took our seats along the first-base line and immediately saw Hideki Matsui ground out to second. Didn’t we used to have a slugger with a Russian first name batting in that spot? Polos didn’t want the case. He was a baseball fan and, growing up in L.A., a Dodgers fan, listening to Vin Scully on the radio. He is a moderate Angels fan, taking in five or six games a year. When he was picked to preside over the lawsuit in 2005, he knew it was a hot potato. While it was the jury that ultimately allowed Moreno to call his team the Los Angeles Angels, Polos did make the decision that allowed Moreno to keep the L.A. name for at least the duration of the trial. But had the city of Anaheim come forward before Moreno had actually changed the name, the ruling, at least at that initial stage, might have gone the other way, Polos said. In other words, Polos would have merely been stopping Moreno from going forward – not requiring him to undo something. “There was some thought that the city came in a little too late,” Polos said. “At first blush,” it did appear the city had a winning argument, he said – that Moreno had pulled a fast one and violated the Implied Covenant of Good Faith and Fair Dealing that’s part of every contract. But he believes Moreno had three things going for him that the city couldn’t overcome: 1) The surprise testimony of former Disney exec Larry Murphy, who, contrary to two other execs, said he had contemplated before signing the contact that “Los Angeles” might be in the team name; 2) The jury was being asked not just to eliminate L.A. from the name but would be dictating to the owner that his team would have to be named, precisely, the “Anaheim Angels,” which Polos believes the jurors felt uncomfortable with; and 3) Moreno himself. The smiling, affable owner was sitting at the defense table every day of the trial. Just then, we saw Bobby Wilson hit his first MLB home run, putting the Halos up a comfortable 4-1. My new hero. Although, it was ultimately the jury’s call, Polos realizes he’s forever tied to the case and the name-change. He got some “scary” e-mails to his home computer after the trial, and “to this day,” he says, “I get neighbors, friends, calling me an idiot…. I would call it good-natured, though.” And, he notes, history may well eclipse what transpired in his courtroom. In fact, there’s a 2014 opt-out clause. Something tells me Polos wouldn’t mind if somehow “Anaheim” sneaked to the front of the name again.